This season, houses and storefronts aren’t the only things being decked with holiday lights. Theatre lights are up on a variety of holiday-themed shows around San Diego perfect for the whole family. From that infamous thieving Grinch at the Old Globe Theatre to an evening of Celtic songs with the San Diego Symphony, enjoy a night on the town that is certain to brighten the spirits and warm the hearts this holiday season. 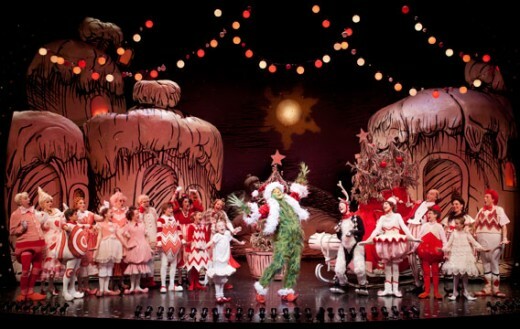 Whoville comes alive in “How the Grinch Stole Christmas!” at the Old Globe Theatre in San Diego. Bring the family to Whoville! Back for its 15th incredible year, Dr. Seuss’ How the Grinch Stole Christmas! is taking over the Old Globe Theatre with family favorite songs, “This Time of Year,” “Santa for a Day” and “Fah Who Doraze,” the delightful carol from the popular animated version of “How the Grinch Stole Christmas!” The Grinch makes it easy to take the whole family to the theatre, with 11:00 AM matinée performances open to all ages, including children under the age of 3 years old. The Globe will also be offering an autism-friendly performance of The Grinch on December 15, 2012 at 10:30 AM. > Find out more about Dr. Seuss’ How the Grinch Stole Christmas! The San Diego Ballet performs Tchaikovsky’s beloved “Nutcracker” this holiday season. See snowflakes, sugar plums and Russian dancers swoop and soar across the Birch North Park Theatre and the Mandeville Center at UCSD in San Diego Ballet’s performance of Tchaikovsky’s beloved Nutcracker. In its 21st year, San Diego Ballet’s performance of The Nutcracker is brought to life with over 100 beautifully costumed dancers, directed and choreographed by Robin Sheretz-Morgan and Javier Velasco. A Festival of Christmas presented by the Lamb’s Players in San Diego. The Lamb’s Players are bringing back one of Kerry Meads most popular “new” scripts: Christmas on my Mind. A diverse group of travelers finds themselves stranded by an unexpected snowstorm. 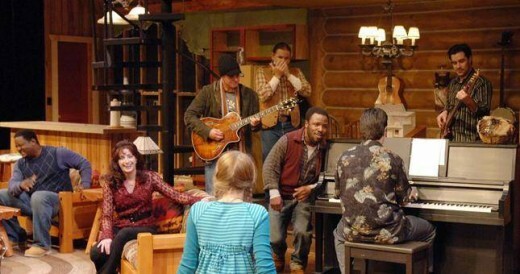 They all make their way to a cabin in the woods and create a celebration by sharing music and stories. Surprising, fun and refreshing – the performance includes a beautiful blend of original music and traditional favorites. 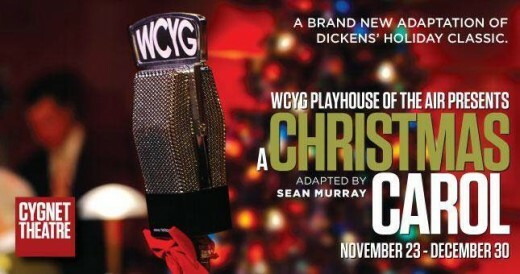 A Christmas Carol told as a 1940s live radio show at Cygnet Theatre in San Diego. Cygnet Theatre continues its annual holiday tradition with a new live radio play. Be a part of the live studio audience as the WCYG Players bring a unique presentation of the classic story, A Christmas Carol, to life in the style of a 1940s radio show. A treat for the whole family, the show is complete with holiday music, commercials and live sound effects. Join the San Diego Symphony as they take a visit to the Emerald Isle for a Holiday Pops: Celtic Celebration. With the “luck o’ the Irish” this holiday season, Grammy® Award-winning nine-time all-Ireland fiddle champion Eileen Ivers joins the San Diego Symphony for an evening of festive Irish holiday favorites including “The Holly Tree,” “Don Oiche Ud im Beithil” (“One Night in Bethlehem”), “Hark, The Herald Angels Sing” (in traditional jig time) and “The Wexford Carol” (dating back to the 12th century) along with so many traditional favorites that we’ve come know. What Would You Endure for an American Dream? This is the inadvertent question asked by the latest La Jolla Playhouse production, Hands on a Hardbody. Based on a 1997 documentary about a group of Texans vying to outlast each other by placing one gloved hand on brand new Nissan truck in hopes of driving off with it, this new American musical engages the audience to ask themselves these questions: What you are willing to do for your dream? Would you stand under the searing Texas sun for days with nine other strangers? Endure sleep deprivation, hallucinations and numbness of limbs for a chance to drive off the lot in a brand new truck? As I sat comfortably in the La Jolla Playhouse’s intimate Mandell Weiss Theater, I knew I wasn’t crazy enough to put myself through that kind of torment, which is what made the premise all the more intriguing. 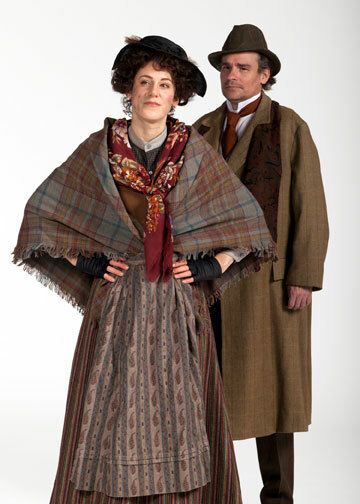 But an alluring premise does not a successful musical make. After all, how do you make a group of people standing around a truck come alive on stage? My curiosity peaked as the first character took the stage. Creative force behind Hands on a Hardbody (L-R): Doug Wright, Trey Anastasio, Amanda Green and Benjamin Millepied. The creative force behind Hands on a Hardbody consists of Pulitzer Prize and Tony Award Winning writer (and Texas native) Doug Wright, music composed by Trey Anastasia (founder of the band Phish), lyrics by Amanda Green (Broadway’s High Fidelity and Bring it On: The Musical) and stage choreography by Benjamin Millepied (Black Swan). The result of their collaboration is nothing short of a vibrantly composed, elegantly choreographed and spirited production. (L-R) Jay Armstrong Johnson, Keala Settle, Hunter Foster and Keith Carradine. Photo by Kevin Berne. I have not seen the original documentary, but after viewing some clips on YouTube, it seems they remain quite true to the real people, down to the mustache of Benny Perkins (played by Hunter Foster) and the headphones of Norma Valverde (played by Keala Settle). The colorful cast of characters each have their own motivation and purpose, but are all driven to the truck by the same force of economic depravity. 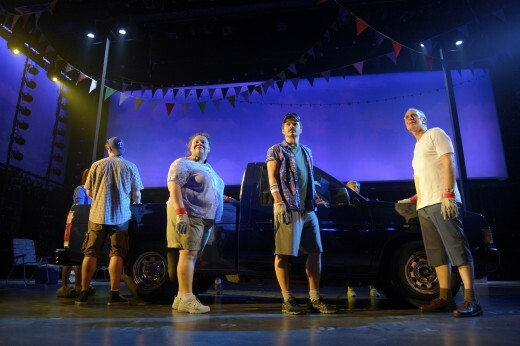 The truck, symbolizing the American Dream (ironically a Japanese-made Nissan model) is the notable 16th character, which lights up, honks and moves fluidly on the stage with the characters. 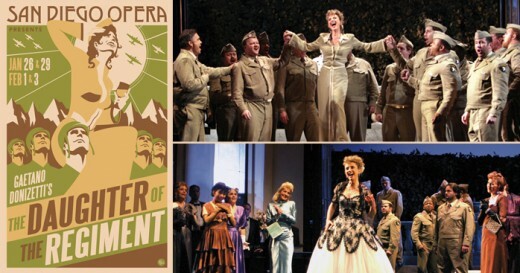 Each character’s story unfolds through song. The catchy melodies and heart-felt lyrics draw the audience into their struggles. The truck means something different for each person: a one-way ticket to Hollywood; God’s will; or a means for college tuition. (L-R) Jay Armstrong Johnson, Allison Case and Hunter Foster. Photo by Kevin Berne. I found myself rooting for my favorite character, just as an observer from grand stand at the Texas dealership or the radio listener who followed the 5-day contest must have. One by one, the characters drop off as their hopes for the truck fall away with them, until one victor remains. 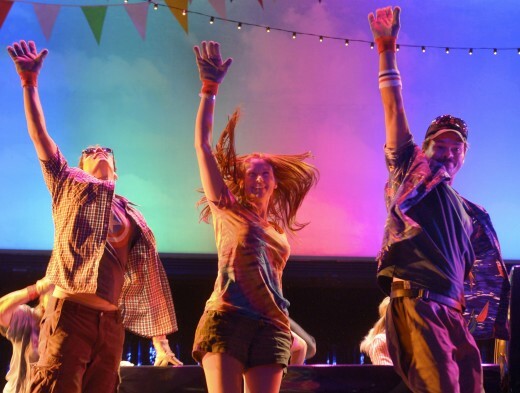 As the cast takes the stage one last time for the final score, their collective hopes rise again, permeating the audience with the enduring message that far exceeds the prize itself: If you love something, keep your hands on it. The performance on Saturday night ended with a standing ovation from the crowd. My husband and I left the theater, hand-in-hand, reminded and inspired to pursue our lives with a little more heart, and how gel insoles could help us along the way. 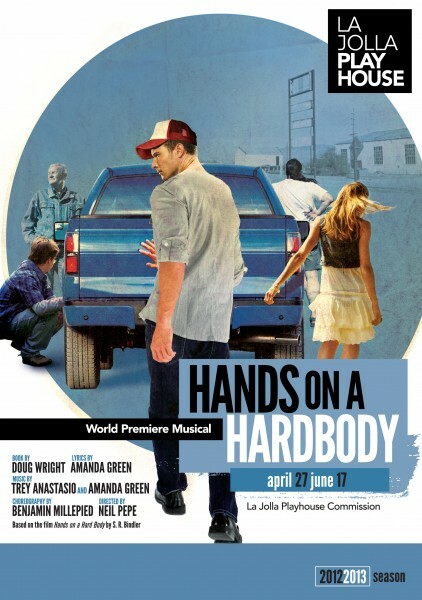 La Jolla Playhouse’s world-premiere, commissioned musical Hands on a Hardbody runs through June 17 in the Mandell Weiss Theatre. 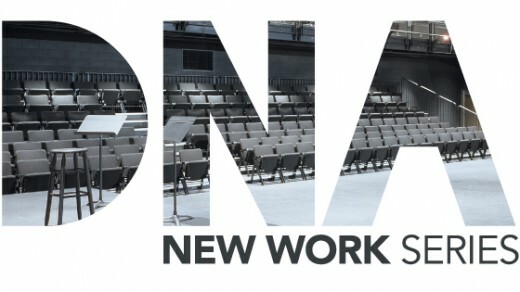 Book by Doug Wright, lyrics by Amanda Green, music by Trey Anastasio and Amanda Green, directed by Neil Pepe, musical staging by Benjamin Millepied. So tell us in the comments below, would you be willing to endure five days under the scorching sun for the chance to take home your dream…a new car?